An angry and self-loathing veteran of the Korean War, Frank Money finds himself back in racist America after enduring trauma on the front lines that left him with more than just physical scars. His home–and himself in it–may no longer be as he remembers it, but Frank is shocked out of his crippling apathy by the need to rescue his medically abused younger sister and take her back to the small Georgia town they come from, which he’s hated all his life. As Frank revisits the memories from childhood and the war that leave him questioning his sense of self, he discovers a profound courage he thought he could never possess again. A deeply moving novel about an apparently defeated man finding his manhood–and his home. I really liked Home! I read Sula and Beloved a few years ago, and while I liked them, I wasn’t completely into them. But I figured it was a good time to give Morrison another try, and I’m actually really glad I did. I really liked Frank, and how he had to deal with memories and what happened in Korea. And he goes on a journey to help his sister, who went through some horrible things herself. I really like seeing his memories and how he got to be the person we see at the beginning of the novel to how he became the person we see at the end of the novel. I was struck by how Frank was trying to deal with everything that’s happened, and how he was trying to find his place after coming home. You could tell how hard it was for him, and it’s something that still rings true today- with all of the stories of soldiers coming back with health issues and PTSD, and all of the recent events in places like Ferguson, you see how we’ve changed a lot, but at the same time, it’s still something that we’re dealing with. Home is short, but Morrison makes every word count. It’s simple and beautiful and this is one of the very rare books where I’m more interested in the actual writing than the story (even the story is great too). Seriously, if you want to study writing, Toni Morrison is such a great place to start. She can write, and she does it so well. I really liked seeing Frank have to deal with so much, and even though his story takes place after the Korean war, so many things (like racism and PTSD) are still relevant today. 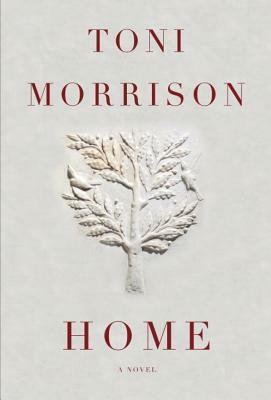 It’s also a simple but beautifully written book, and of the 3 books I’ve read by Morrison, I think this is a really good one to start with if you’ve never read Morrison. Home gets 4 stars.